It is always a major event when we denizens of Planet Opera gather to celebrate. 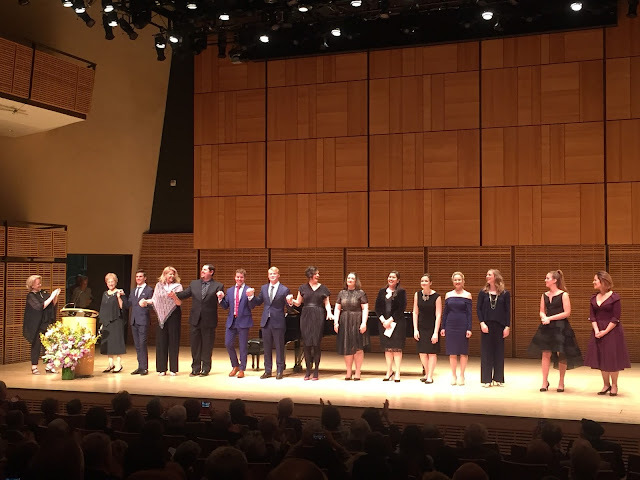 Last night at Zankel Hall the Gerda Lissner Foundation, in association with The Liederkranz Foundation, presented a dozen top prize winners to delight our thirsty ears. This is a tough competition and there were four hundred or so applicants from all over the world, out of which 33 were chosen for awards. Hostess Midge Woolsey and honoree Susan Graham, the superstar mezzo we all adore, were delightful as always and kept their comments brief. The stunning mezzo-sosprano addressed the importance of these awards to young singers who are between school and major careers. They are facing auditions, competitions, the search for effective management, and church jobs to keep going. They need people to believe in them and support them, and that's where we come in. We in the audience serve to validate them and offer them the confidence to keep going in these scary and uncertain times. And we thought we were just there for the pleasure of listening! It was helpful to be reminded that these award recitals are a two-way street. Mutual benefit is always good! So let's all have a big hand for the generous Gerda Lissner Foundationk. Ms. Lissner lived for over a century and her memory lives on through the foundation that was established in 1995. The dedicated President Stephen de Maio has served since 2007. Two years ago a lieder competition was established to foster the survival of the art of the song. We opine that the judges, the list of whom looks like a "Who's Who on Planet Opera", chose well. Some of the winners were known to us from other competitions or from our local music conservatories, or from the Apprentice Program at Santa Fe Opera. Others were new to us. We will never tire of hearing soprano Vanessa Vasquez singing "Un bel di vedremo" from Puccini's Madama Butterfly. In addition to a sizable instrument with thrilling overtones , Ms Vasquez has the special ability to get the listener to see what she is singing about, through her eyes. We feel that we know and understand Cio-Cio San through her artistry. Most likely, the pacing and dynamics were carefully worked out, but it felt spontaneous as she built to a passionate finale. Bass-baritone Andre Courville also has a "signature number" that we have heard and enjoyed before. It makes no difference to us if singers choose to put their own stamp on an aria that we've heard countless times, or whether they choose a little known aria and make it their own, as Mr. Courville did with the "Air du Tambour-Major" from Ambroise Thomas' Le Caid. He entered from the rear of the house and sat on the edge of the stage, making the character completely his own before rising to the occasion, so to speak. He used all his artistry, swooping up and down the register in fine French. We couldn't help wondering whether his Louisiana background contributed to his Gallic charm. In any case, he owns that aria! Alasdair Kent has also been appearing in (and winning prizes in) lots of competitions. We have come to look forward to his sweet timbre that goes right to the heart. Unlike so many tenors who can't sing at the top of their register without pushing and going for volume, Mr. Kent knows how to float the tone in the most rapturous pianissimo. From Bizet's Les pecheurs de perles, he poured his expressive soul into the aria of the lovesick Nadir "Je crois entendre encore". There was an extended decrescendo at the end through which we held our breath. What incredible breath control! His, not ours! Mezzo-soprano Emily d'Angelo is yet another young artist destined for success. Her instrument has texture to it and she knows how to get an aria across, She made a fine Rosina in "Contro un cor che accende amore" from Rossini's Il barbiere di Siviglia in which she created a character so effectively that the embellishments seem to come from within, not pasted onto the vocal line for effect. She was generous with gesture and we thought we learned more about Rosina's personality. Another mezzo, Suzanne Hendrix, sang Erda's warning to Wotan in Wagner's Das Rheingold--"Weiche Wotan weiche" and she sang it with splendid dynamic control. We heard the making of a contralto in her future and so did our companion, but a voice teacher we spoke with did not agree. In any case, the texture of her instrument is dense and resonant and just right for Wagner. Perhaps not right or not yet ready for this particular Wagner, bass-baritone Lawson Anderson did his best with "Abendlich strahlt der Sonne Auge", also from Das Rheingold. We have heard Mr. Lawson sing Gounod, Mozart, and Wolf--all beautifully. There was nothing bad about his Wagner but we are not sure why he was asked to sing Wotan. To compete for the Liederkranz, he might have better chosen Wolfram's aria "Oh du mein holder abendstern" from Tannhauser, which we believe would better suit his young voice. Still, the Liederkranz Foundation awarded him a major prize so....just sayin'. Soprano Alexandra Nowakowski sang the "Bell Song" from Delibes' Lakme with crystalline tone and complete comfort with the vocal acrobatics. Actually, it was a bell-like sound! We couldn't stop thinking what a fine Queen of the Night she would be, although she is already scheduled to sing Pamina. We would surely love to hear her Lucia. Mezzo-soprano Megan Mikailovna Samarin sang "Deh! Tu, bell'anima" Romeo's final aria at Giulietta's tomb in Bellini's I Capuleti e i Montecchi. Her lovely liquid vibrato was completely exposed in the introductory bars until the piano joined in. She was particularly lovely in the pianissimo passages. There was more R&J to come, this time from Gounod's Romeo et Juliet. Mezzo-soprando Corrie Stallings sang Stephano's aria "Que fais-tu, blanche tourterelle" with ample expressiveness, creating the vivacious character of a young page. Her French was fine and we liked her vivacity. We heard still more Gounod in the person of Bass-baritone Joseph Barron who performed "Vous qui faites l'endormie" from Faust. Punctuated by devilish laughter, his expansive delivery grew in impact. He modulated his performance with some admirable phrasing and considerable variety. Like any good hostess, we have put the "guests" first, having saved our New York City singers for last. What a pleasure to hear soprano Angela Vallone sing the rarely heard "Azael! Azael! Pourquoi m'as tu quittee?" from Debussy's L'enfant prodigue. This maternal lament hasn't been heard since Bare Opera produced the work exactly two years ago. Ms. Vallone gave full measure to the flowing lyric lines which were interrupted by the mother's anguish over her missing son. Her tone was beautifully sustained throughout the pianissimo passages. And finally, there was the lovely soprano Maria Brea, well known for her stylish performances with Martina Arroyo's Prelude to Performance. She gave a lovely performance of "Chi il bel sogno di Doretta" from Puccini's La Rondine. Her expressive voice soared up to a beautiful top and we enjoyed the finely controlled crescendo. As usual, excellent piano accompaniment was provided by Arlene Shrut and Jonathan Kelly. The concert was followed by a cocktail hour and dinner, giving the fortunate guests an opportunity to tell the young artists how highly we value their performances. They are already singing roles around the country and abroad and we foresee some fine futures ahead for every one of them.